A sanitary sewer collection system has basically two main functions: to convey the designed peak discharge and to transport solids so that deposits are kept to a minimum. It is imperative, therefore, that the sanitary sewer has adequate capacity for the peak flow and that it functions at minimum flows without excessive maintenance and generation of odors. InfoSewerH20Map Sewer uses an efficient methodology that allows you to accurately design portions of the sewer network, from a single pipe to the entire system. In this explicit design method each sewer pipe is designed independently without consideration of the flows in other pipes. This can be done because to design a sewer, only the peak discharge is required. The method is attractive because it does not require re-computation of the flow in upstream pipes. InfoSewerH20Map Sewer gives you considerable flexibility to design a new sewer collection system or an existing sewer system. Increased sewer flows and/or aging of sewer pipes may call for the design existing sewer systems. InfoSewerH20Map Sewer designs existing pipes considering flow capacity constraints while minimizing cost. The model analyzes capacity of existing sewer systems and designs pipes that are transporting flow in excess of the desired capacity. InfoSewerH20Map Sewer/Pro will determine the optimal replacement and parallel (relief) pipe sizes where pipe capacity is exceeded (i.e., when existing pipes have depth-to-diameter ratios or flow depth-to-channel depth ratios exceeding user specified limits derived from the analysis criteria curve). 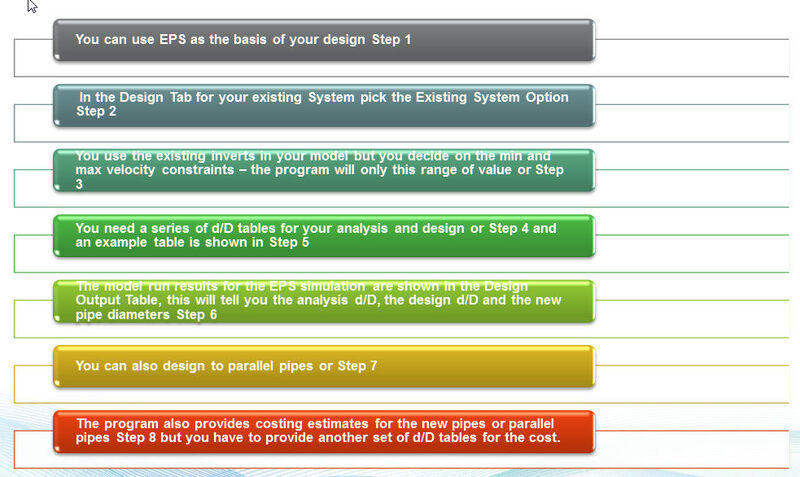 The design cost for replacing and duplicating (paralleling) a pipe will also be calculated. A different Manning coefficient is then used when designing those pipes exceeding their analysis capacity. The replacement and the duplication channels will have the same shape as the existing channel (i.e., if an existing closed rectangular channel is found to be deficient, the replacement and/or the relief channel will also be a closed rectangular channel). In addition, InfoSewerH20Map Sewer makes sure that flow velocity in the designed pipes meet a user-specified minimum (e.g., not to be less than 2 ft/s to prevent or minimize permanent deposition in the pipes) and maximum (e.g., not to exceed 10 ft/s to prevent the occurrence of scour or other undesirable effects of high velocity flow) design velocities. InfoSewerH20Map Sewer can design a new sewer collection system given manhole locations, pipe lengths, sewer loads, topographic data of the sewershed, and design criteria. For new sewer design, the objective is to determine size and slope of a conduit that carries a given flow while maintaining velocity and cover depth within a desired range. 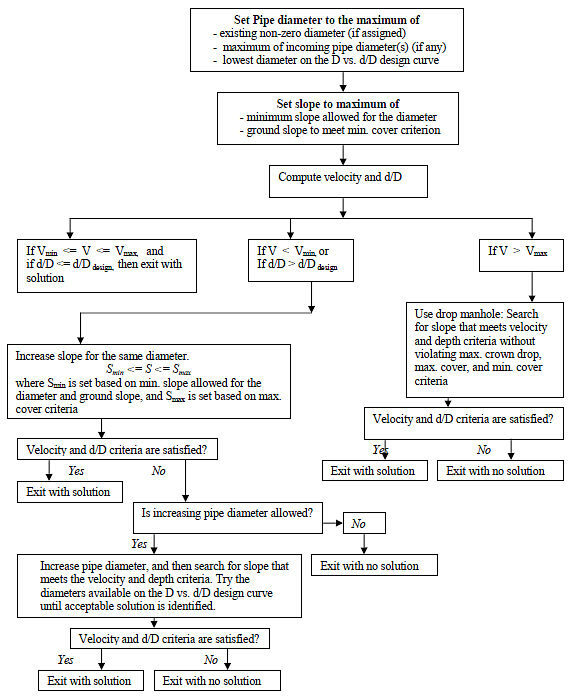 The model calculates design flows, which may include both dry weather flows and wet weather flows, and determines pipe size and slope at minimum cost considering various design criteria including depth to diameter ratio, velocity, and cover depth. InfoSewerH20Map Sewer will determine the optimal replacement and parallel (relief) pipe sizes where pipe capacity is exceeded (i.e., when existing pipes have depth-to-diameter ratios or flow depth-to-channel depth ratios exceeding user specified limits derived from the analysis criteria curve). The design cost for replacing and duplicating (paralleling) a pipe will also be calculated. A different Manning coefficient is then used when designing those pipes exceeding their analysis capacity. The replacement and the duplication channels will have the same shape as the existing channel (i.e., if an existing closed rectangular channel is found to be deficient, the replacement and/or the relief channel will also be a closed rectangular channel).